The second largest of the Canary Islands attract huge numbers of sun-worshipers and water sport practitioners in search of one thing: the most pristine beaches in the archipelago. You can't blame them. The golden sand, cool water and gentle sea breeze of Fuerteventura are head and shoulders above those of its neighbours. Catch a cheap flight to Fuerteventura with Aer Lingus and enjoy a quick and comfortable journey. 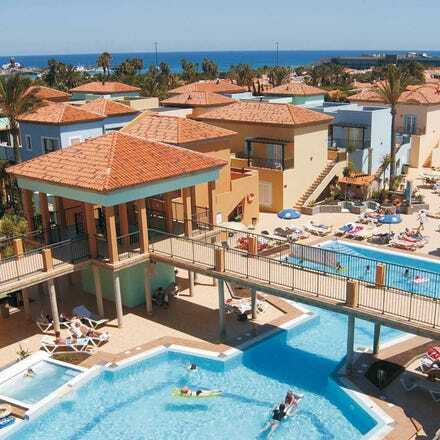 There two flights per week to Fuerteventura from Dublin Airport Terminal 2. Once you reach Fuerteventura, you can take advantage of car hire deals with our travel partner, or reach your destination by bus or taxi. Fuerteventura has so much to offer, from barren dessert scenery and fascinating volcanoes to colourful and characterful towns and pleasant harbour promenades, all of which visitors would be foolish to miss out on. Fuerteventura Airport (FUE) is situated mid-way up the island's east coast, 3 kilometres from Puerto del Rosario and 35 kilometres from Corralejo. There are three airport bus routes. Line 3 serves Puerto del Rosario and the tourist areas of Caleta del Fuste and Las Salinas. The bus leaves every 30 minutes. The other routes run to Puerto del Rosario, Morro Jable and Gran Tarajal. Taxis are also available outside the arrivals hall. Alternatively, you can rent a car at one of the on-site offices. Fuerteventura has a good local bus network serving most parts of the island (except parts of the southwest coast). For more flexibility it is better to hire a car, as the road network is generally very good. If you are more active, mountain bikes can also be hired. Taxis are generally inexpensive and in good condition. Fares subject to terms, conditions and availability.